I haven’t been around to post lately because I had a slight accident. The vet suggested that I should write about the trauma. Since the word catharsis starts with cat, I agreed. As far as my apes know I just showed up one Sunday morning with a weird looking eye and a lot of coughing. I know what I did and I’m not telling. After all I am a cat and I don’t make mistakes. I meant to do it. That’s my story and I’m sticking to it. When the eye didn’t clear up right away they called the vet first thing Monday. She thought this sounded bad so made time to take me in for a look. The vet did her usual poking and prodding. They even took x-rays and couldn’t see any damage. Then she shined a light in my eye and looked real close. That’s what really hurt. Doesn’t she know my eyes take in extra light so I can see in the dark? I’m saving a special nip of her hand for that one. Then the apes stood around and had a discussion about what could have happened. One thought that it was a bite from something I was chasing. Another thought I missed the jump onto my favorite shelf. The vet suggested I got grazed by a car. Of course she thinks cats should be kept inside to be safe from things like that. We all know there’s two sides to that argument. Mine usually involves holding the furniture for ransom. 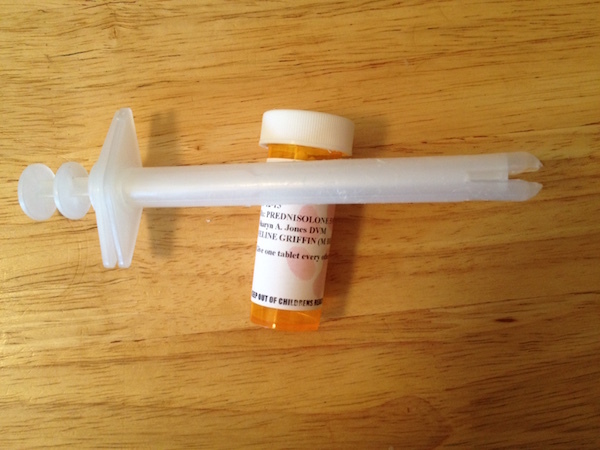 Ever since then they’ve been using this long plastic stick to cram pills down my throat. At first I just took it and swallowed without too much fuss. I know they’re doing this in an attempt to make me feel better but for the love of Mike enough is enough. This last week I’ve made sure that it took at least two of them to hold me down. There has been blood – there will be more. If they don’t stop doing this by the end of the month I’m causing some serious furniture damage. Besides, I’m doing just fine thanks. To prove it, last week I brought in two dead mice and one not-so-dead bird all in one day. The ape-who-brings-food put them all in plastic bags and took them outside to save for snacks later. At least I think that’s what he does. I never see the yummy creatures again.